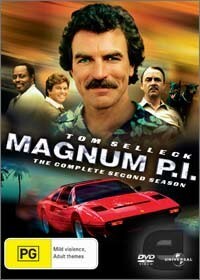 Ah Tom Selleck. In the 1980s, a moustache and hairy chest made you the hunkiest thing outside a butcher shop. He wers sunnies, drives a red Ferrari and lives in beautiful Hawaii. What’s more, he lives in the mansion of a rich English aristocrat Higgins (John Hillerman) and only occasionally (when in a TV episode!) he has to semi-comically solve a mystery, often of a criminal nature. What a life! I must say I can’t really see the appeal of this show. The writing is often mediocre and the performances are a bit… awkward. I guess maybe because it came slightly after, but I’d place my money on “Moonlighting”. Bruce Willis’ and Cybil Shepherd’s chemistry made for some zesty viewing—that angle is completely lacking in Magnum, P.I. Fishing for campy elements is also an unrewarding experience. This made it very hard viewing for me. From what I see, there are many avid fans of this show. It is those people who should go out and buy this series. We uninitiated would probably prefer to remain that way. The only way I would see myself watching this is drunk and in a big group of friends. Alone, at night time, the potential for dozing off is very high! It’s weird, but a lot of the dialogue, design and ‘feel’ of the show have a very dated quality about them. Principally for this reason, and the others mentioned, I failed to be impressed.